The easiest way for any newcomer to understand the layout of Rio is to take a trip to the top of Corcovado from where the city sits below as a living map. From the summit everything slots nicely in to place and for the first time you can appreciate that Ipanema and Copacabana sit at almost right angles to each other and don’t run straight. At the Paineiras Visitor Centre, located just below Corcovado, you can see a large 3-D model of the city. 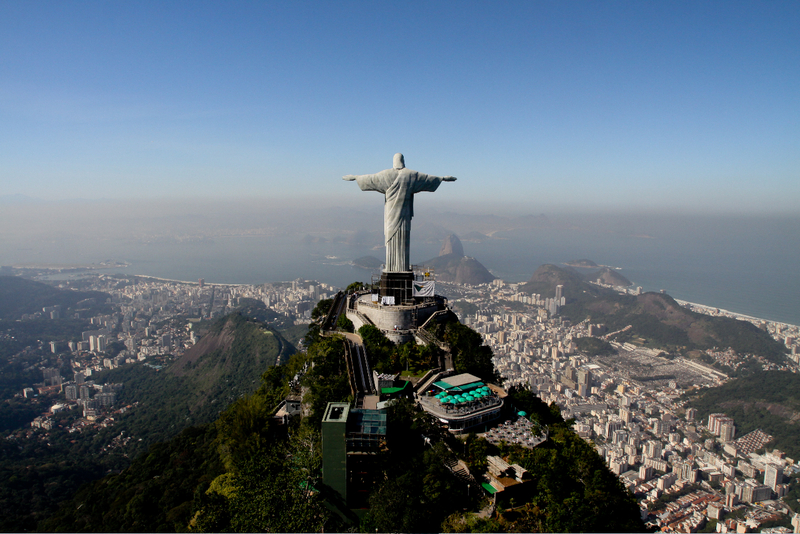 Corcovado and the statue of Christ dominate the Rio skyline and is a reference point the likes of which no other city can lay claim. Just remember where you are staying or going in relation to Christ and you should never get lost. As he stands, Christ looks directly over Botafogo to Sugar Loaf (and beyond to the coast of Namibia). 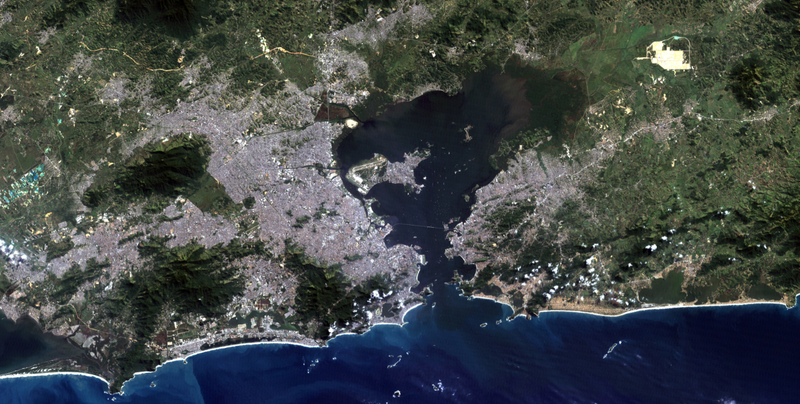 To his left are Glória and Centro, to his right the Lagoa, Copacabana, Ipanema and Leblon. Thanks to Corcovado it is almost impossible for a newcomer to get lost for any length of time in Rio. In fact, Rio is probably one of the easiest of all the world’s major cities for a visitor to find their way around as most of the city’s main residential and tourist areas are to be found along the waterfront. Once you know what fits where it is just a question of following the coast road along (or the metro). 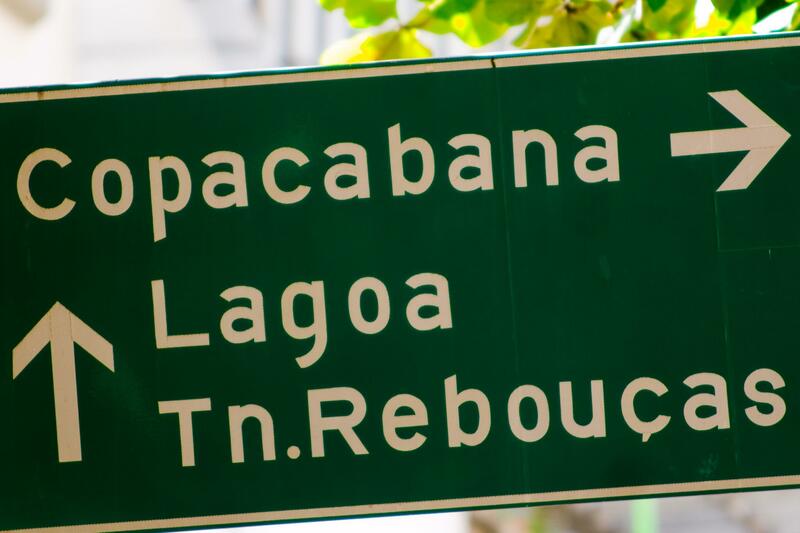 Starting in the city center, Centro, you have Flamengo followed by Botafogo, Leme, Copacabana, Ipanema, Leblon, Vidigal, São Conrado, Barra da Tijuca, Recreio dos Bandeirantes, Prainha and Grumari. So, if you are staying at a hotel in Copacabana and want to go to play golf at the Gavea Golf club in São Conrado you just follow the coast along passing through Ipanema and Leblon on the way. What could be simpler? The easiest way to get around in Rio is the city’s taxis or the metro. Clean, efficient and relatively cheap in world terms, Rio’s taxis are the answer to any commuter’s prayer. Abundant in most parts of the zona sul, unless it is raining, taxis can normally get you to your destination in any other part of the zona sul in less than thirty minutes. With a cab you won’t get lost and you won’t waste valuable time. As in all cities of the world, avoid taxis that hang around by the doors of the hotels. You can flag down a yellow taxi pretty much anywhere in Rio. You can also call for a taxi to come and meet you, especially the more comfortable air-conditioned executive taxis operated by Coopertramo, Cootramo and Transcoopass. Rio also has Uber and a number of similar services, but you may need to speak Portuguese! 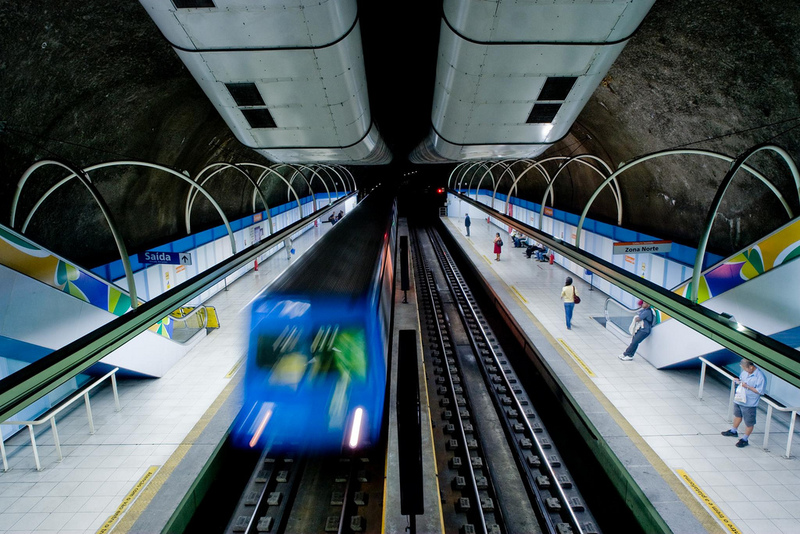 Rio’s other main public transport system is the metro (subway) that now links Barra da Tijuca and Ipanema with Centro and beyond. Unlike most subway systems, the Rio one is clean, comfortably air-conditioned and safe both as a transport system and for you personally. It is by far the easiest (and fastest) way to get from Copacabana, Ipanema, Sao Conrado and Barra da Tijuca to Centro. It has a good website in English with maps and information about the stations. 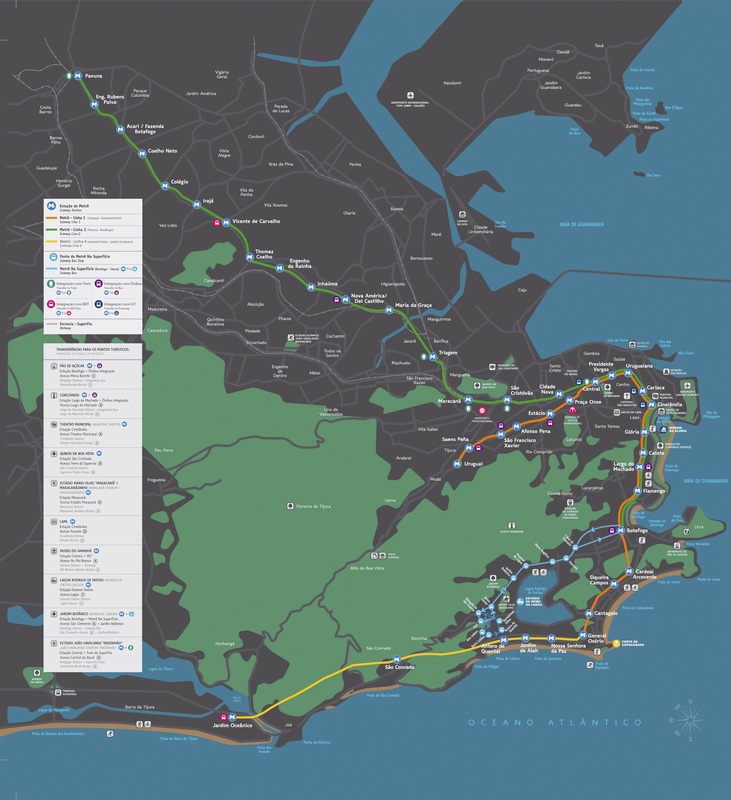 With the extension of the metro in Rio through Copacabana to Ipanema and Barra da Tijuca, the system has become of much more use to visitors either wanting to get downtown from the beach areas or to get to the beaches from the hotels in Botafogo, Flamengo and downtown. There is also a metro stop right next to the Maracanã stadium and also a choice of two close to where the main carnival parades take place. In Rio you are never very far from a bus or bus stop. There are thousands of them, and because of this the main problem for any visitor is finding which is the right bus to get on and which is going in which direction, as many routes are circular. Pick the wrong one, and you can end up miles off your intended route. With the buses it is a case of “the good, the bad and the ugly”. 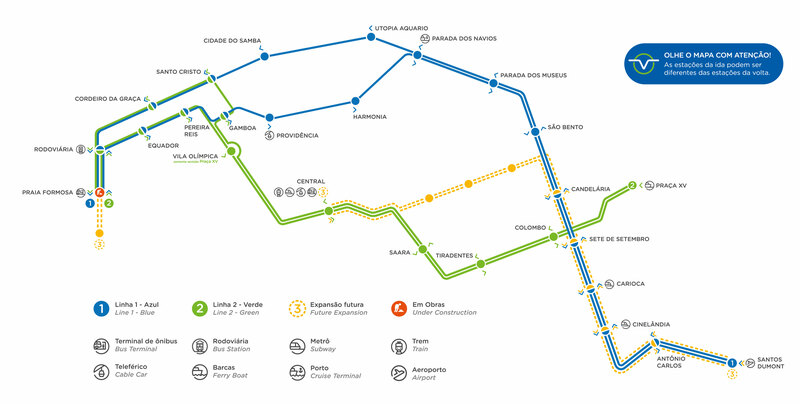 The “good” is represented by the executive service that links the zona sul with the city center and vice versa, and the Bus Rapid Transit, TransCarioca Express, that links the international airport to Barra and the metro to Barra (Transoeste); “the bad” by the normal bus services that, although plentiful and cheap, are best left to the residents; and “the ugly”, by the bus drivers in general. A few “dos and don’ts” as far as the buses go. Bus routes are posted on the back door of the bus and if you have any doubt you only need to shout the name of your destination to the conductor (ticket seller) who sits at the back or front of the bus. Buses are cheap. You normally pay the conductor or the driver and the price will be posted behind them. Try to have the right change ready as you will not be popular if you delay the bus by digging in to your bag to find the money. You will also be showing any potential thieves exactly where you keep your wallet. Buses are a popular location for holdups and robberies so watch yourself. Get on the bus with your fare in hand. Pay and go through the turnstile. Be alert when going through the turnstile. You are being funneled through a small opening, the perfect location for pickpockets to work, sometimes in league with the conductor and driver. Keep your bag and wallet in front of you where you can see them. Never flash large sums of money, cameras, or other valuables about on the buses. Someone will take them from you and jump off the bus. 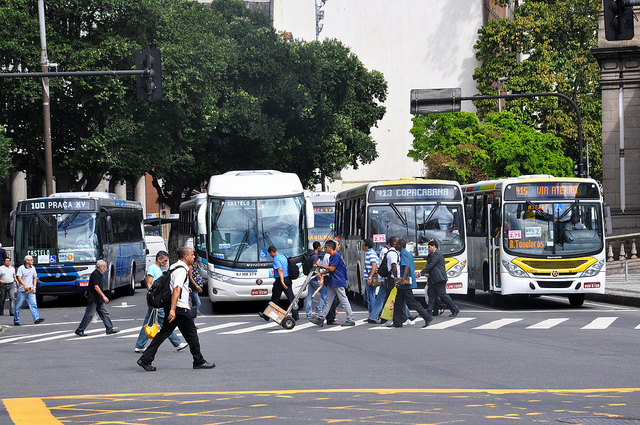 Buses in Rio and Brazil are designed to get people from A to B. They are not intended for tourists so don’t go sightseeing on them. Use them for travel when you don’t have your camera with you. If you pay 50 cents for a bus ride instead of $5 for a cab you must expect what you get. The choice is yours, make it sensibly. 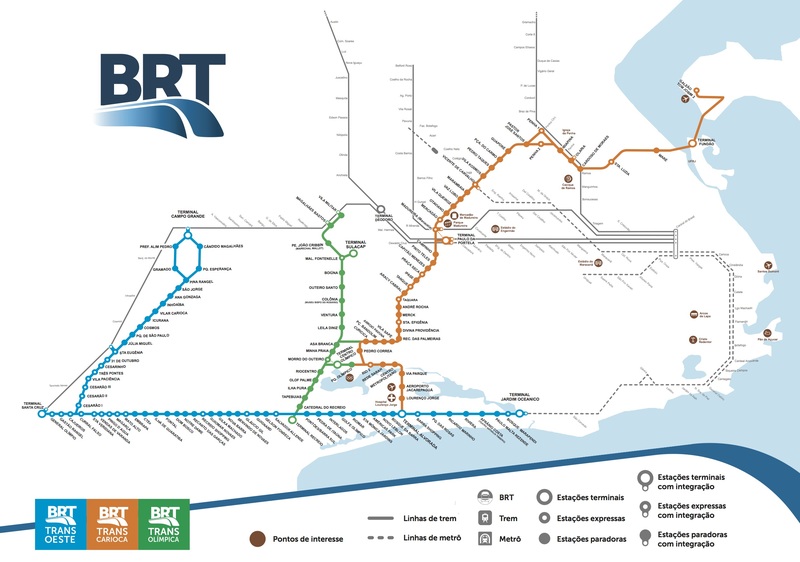 In Centro, or downtown Rio, there is also the option of taking the new tram or Rio Light Rail (VLT Carioca) that was inaugurated for the Olympics. 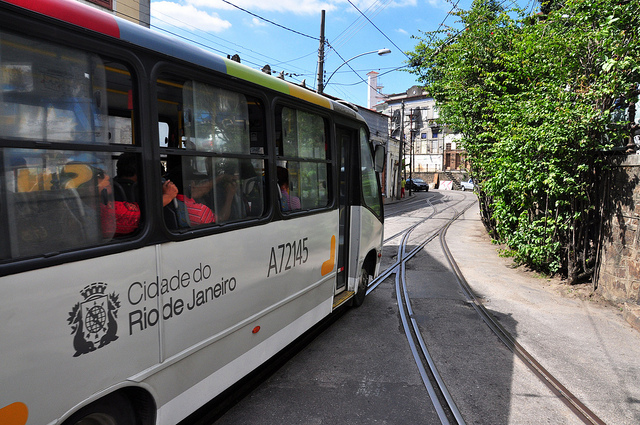 The tram runs up through the heart of Centro from the Santos Dumont Airport to the port and beyond. The tram stops next to both Carioca and Cinelandia metro stations. Unless you know Rio well it is often better to stick to taxis than rent a car which you may have trouble parking. There is no particular secret to surviving on the Brazilian roads except the will to survive. Do remember that it is not what you do that matters, but what the other lunatics get up to. Brazil has produced a number of top motor racing drivers, including the world champions Emerson Fittipaldi, Nelson Piquet and Ayrton Senna. After you have driven a car in Brazil you might understand why. That said, any driver who is used to driving and surviving in a large city should not have too many major problems in Rio or São Paulo but it is still worth looking out for some of the locals’ more unusual habits. Included amongst these is passing on both sides, which can come as a bit of a shock if you are the car in the middle of the sandwich; the total lack of any form of lane discipline; and the habit of going through lights long after they have changed to red. In many parts of the city the traffic signals get ignored after 22.00 so do keep a look out even if your light is green. To avoid accidents, or incidents, go with the flow of the traffic. It is never difficult to get back to where you were in Rio and you surely value your life more than a ten-minute detour. But do think about where you might turn around. If you have the nerve, do hire a car while you are in Rio. It will be the only way that you can get the chance to visit some of the city’s more unspoiled beaches and it is a positive necessity if you wish to explore Búzios, the Green Coast or even Barra. But remember, most of the rental companies can also supply a driver who may help your peace of mind, or there is always a taxi. The big international car rental companies such as Avis and Hertz operate in Rio and all the major Brazilian cities alongside national and local companies. The rental agencies accept most credit cards but tend to restrict the minimum age of the driver to 25. 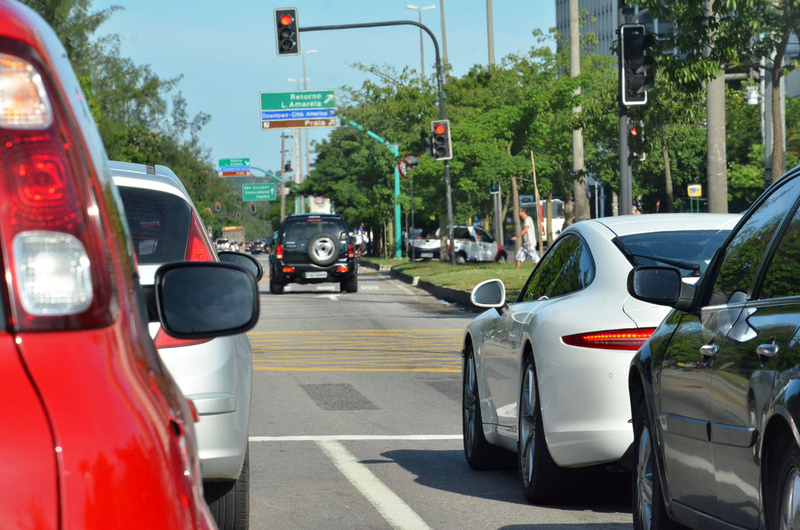 As a visitor all that is required to drive in Brazil is a full valid British or European driving licence. It is preferable to take a licence with a photo. Parking in Rio de Janeiro is chaotic, at best, but not difficult. The locals’ attitude is: “If in doubt, park”. Take full advantage of the fact that most restaurants have valet parking and will park your car for you for a small gratuity. There is zero tolerance to drink and drive in Brazil. Rio, and Brazil in general, is well signposted so that once you know where you are heading for it is only a question of getting in the car and following the signs, remembering which areas you have to go through first as these may be the first to be signed. We know of people who managed to drive from Rio to Belém, a distance of over 3,270 km (2,000 miles), without a map or a word of Portuguese, so it really isn’t that difficult.